Kruglikov, Boris; Tomoda, Kentaro. A criterion for the existence of Killing vectors in 3D. Classical and quantum gravity 2018; Volum 35 (16). ISSN 0264-9381.s 1 - 23.s doi: 10.1088/1361-6382/aad11d. Kruglikov, Boris. Symmetries of second order ODEs. Journal of Mathematical Analysis and Applications 2018; Volum 461 (1). ISSN 0022-247X.s 591 - 594.s doi: 10.1016/j.jmaa.2018.01.026. Doubrov, Boris; Ferapontov, Evgeny V; Kruglikov, Boris; Novikov, Vladimir S. On integrability in Grassmann geometries: integrable systems associated with fourfolds in Gr(3,5). Proceedings of the London Mathematical Society 2018; Volum 116 (5). ISSN 0024-6115.s 1269 - 1300.s doi: 10.1112/plms.12114. Kruglikov, Boris; Schneider, Eivind. Differential invariants of Einstein-Weyl structures in 3D. (data) (fulltekst) Journal of Geometry and Physics 2018; Volum 131. ISSN 0393-0440.s 160 - 169.s doi: 10.1016/j.geomphys.2018.05.011. Kruglikov, Boris. Conformal differential invariants. Journal of Geometry and Physics 2017; Volum 113. ISSN 0393-0440.s 170 - 175.s doi: 10.1016/j.geomphys.2016.06.008. Isaev, Alexander; Kruglikov, Boris. On the symmetry algebras of 5-dimensional CR-manifolds. Advances in Mathematics 2017; Volum 322. ISSN 0001-8708.s 530 - 564.s doi: 10.1016/j.aim.2017.10.020. Kruglikov, Boris; Winther, Henrik; Zalabová, Lenka. SUBMAXIMALLY SYMMETRIC ALMOST QUATERNIONIC STRUCTURES. Transformation groups 2017. ISSN 1083-4362.s 1 - 19.s doi: 10.1007/s00031-017-9453-6. Doubrov, Boris; Ferapontov, Eugene V.; Kruglikov, Boris; Novikov, Vladimir. On a class of integrable systems of Monge-Ampère type. Journal of Mathematical Physics 2017; Volum 58 (6). ISSN 0022-2488.s doi: 10.1063/1.4984982. Kruglikov, Boris; Winther, Henrik. Reconstruction from Representations: Jacobi via Cohomology. (data) (omtale) Journal of Lie theory 2017; Volum 27 (4). ISSN 0949-5932.s 1141 - 1150. Kruglikov, Boris; Vollmer, Andreas; Lukes-Gerakopoulos, Georgios. On integrability of certain rank 2 sub-Riemannian structures. Regulârnaâ i haoticeskaâ dinamika 2017; Volum 22 (5). ISSN 1560-3547.s 502 - 519.s doi: 10.1134/S1560354717050033. Kruglikov, Boris; Winther, Henrik. Non-degenerate para-complex structures in 6D with large symmetry groups. Annals of Global Analysis and Geometry 2017; Volum 52 (3). ISSN 0232-704X.s 341 - 362.s doi: 10.1007/s10455-017-9561-5. Kruglikov, Boris; Winther, Henrik. Erratum to: Almost complex structures in 6D with nondegenerate Nijenhuis tensors and large symmetry groups. Annals of Global Analysis and Geometry 2017; Volum 51. ISSN 0232-704X.s 419 - 421.s doi: 10.1007/s10455-017-9546-4. Godoy Molina, Mauricio; Kruglikov, Boris; Markina, Irina; Vasiliev, Alexander. Rigidity of 2-step carnot groups. Journal of Geometric Analysis 2017; Volum 28 (2). ISSN 1050-6926.s 1477 - 1501.s doi: 10.1007/s12220-017-9875-3. Kruglikov, Boris; Lychagin, Valentin. Global Lie-Tresse theorem. Selecta Mathematica, New Series 2016; Volum 22 (3). ISSN 1022-1824.s 1357 - 1411.s doi: 10.1007/s00029-015-0220-z. Kruglikov, Boris; Panasyuk, Andriy. Veronese webs and nonlinear PDEs. Journal of Geometry and Physics 2016; Volum 115. ISSN 0393-0440.s 45 - 60.s doi: 10.1016/j.geomphys.2016.08.008. Kruglikov, Boris; Morozov, Oleg. A Bäcklund transformation between the four-dimensional Martínez Alonso–Shabat and Ferapontov–Khusnutdinova equations. Theoretical and mathematical physics 2016; Volum 188 (3). ISSN 0040-5779.s 1358 - 1360.s doi: 10.1134/S0040577916090063. Kruglikov, Boris; Schneider, Eivind. Differential invariants of self-dual conformal structures. Journal of Geometry and Physics 2016; Volum 113. ISSN 0393-0440.s 176 - 187.s doi: 10.1016/j.geomphys.2016.05.017. Kruglikov, Boris; Winther, Henrik. Almost complex structures in 6D with non-degenerate Nijenhuis tensors and large symmetry groups. Annals of Global Analysis and Geometry 2016; Volum 50. ISSN 0232-704X.s 297 - 314.s doi: doi:10.1007/s10455-016-9513-5. Kruglikov, Boris; Matveev, Vladimir. The geodesic flow of a generic metric does not admit nontrivial integrals polynomial in momenta. Nonlinearity 2016; Volum 29 (6). ISSN 0951-7715.s 1755 - 1768.s doi: 10.1088/0951-7715/29/6/1755. Isaev, Alexander; Kruglikov, Boris. A short proof of the Dimension Conjecture for real hypersurfaces in C^2. Proceedings of the American Mathematical Society 2016; Volum 144 (10). ISSN 0002-9939.s 4395 - 4399.s doi: https://doi.org/10.1090/proc/13070. Kruglikov, Boris; Matveev, Vladimir; The, Dennis. Submaximally symmetric c-projective structures. International Journal of Mathematics 2016; Volum 27 (3). ISSN 0129-167X.s 1650022 - .s doi: 10.1142/S0129167X16500221. Dunajski, Maciej; Ferapontov, Eugene V.; Kruglikov, Boris. On the Einstein-Weyl and conformal self-duality equations. Journal of Mathematical Physics 2015; Volum 56 (8). ISSN 0022-2488.s doi: 10.1063/1.4927251. Kruglikov, Boris; Morozov, Oleg. Integrable Dispersionless PDEs in 4D, Their Symmetry Pseudogroups and Deformations. Letters in Mathematical Physics 2015; Volum 105 (12). ISSN 0377-9017.s 1703 - 1723.s doi: 10.1007/s11005-015-0800-z. Kruglikov, Boris. Submaximally symmetric CR-structures. Journal of Geometric Analysis 2015; Volum 26. ISSN 1050-6926.s 3090 - 3097.s doi: 10.1007/s12220-015-9663-x. Kruglikov, Boris. Differential Invariants and Symmetry: Riemannian Metrics and Beyond. Lobachevskii Journal of Mathematics 2015; Volum 36 (3). ISSN 1818-9962.s 292 - 297.s doi: 10.1134/S1995080215030087. Alekseevsky, D.V. ; Kruglikov, Boris; Winther, Henrik. Homogeneous almost complex structures in dimension 6 with semi-simple isotropy. Annals of Global Analysis and Geometry 2014; Volum 46 (4). ISSN 0232-704X.s 361 - 387.s doi: 10.1007/s10455-014-9428-y. Kruglikov, Boris; The, Dennis. The gap phenomenon in parabolic geometries. Journal für die Reine und Angewandte Mathematik 2014; Volum 723. ISSN 0075-4102.s 153 - 216.s doi: https://doi.org/10.1515/crelle-2014-0072. Kruglikov, Boris. Symmetries of filtered structures via filtered Lie equations. Journal of Geometry and Physics 2014; Volum 85. ISSN 0393-0440.s 164 - 170.s doi: 10.1016/j.geomphys.2014.05.009. Doubrov, Boris; Kruglikov, Boris. On the models of submaximal symmetric rank 2 distributions in 5D. Differential geometry and its applications (Print) 2014; Volum 35. ISSN 0926-2245.s 314 - 322.s doi: 10.1016/j.difgeo.2014.06.008. Ferapontov, Eugene V.; Kruglikov, Boris. Dispersionless integrable systems in 3D and Einstein-Weyl geometry. Journal of differential geometry 2014; Volum 97 (2). ISSN 0022-040X.s 215 - 254. Kruglikov, Boris. Symmetries of almost complex structures and pseudoholomorphic foliations. International Journal of Mathematics 2014; Volum 25 (8). ISSN 0129-167X.s doi: 10.1142/S0129167X14500797. Kruglikov, Boris; Matveev, Vladimir. Submaximal metric projective and metric affine structures. Differential geometry and its applications (Print) 2014; Volum 33. ISSN 0926-2245.s 70 - 80.s doi: 10.1016/j.difgeo.2013.10.005. Kruglikov, Boris. Generalized Lie-Backlund theorem for Lie class overdetermined systems. Monatshefte für Mathematik (Print) 2013; Volum 171 (3-4). ISSN 0026-9255.s 395 - 414.s doi: 10.1007/s00605-013-0520-3. Kruglikov, Boris. LIE THEOREM VIA RANK 2 DISTRIBUTIONS (INTEGRATION OF PDE OF CLASS omega=1). Journal of Nonlinear Mathematical Physics 2012; Volum 19 (2). ISSN 1402-9251.s 1250011-1 - 1250011-24.s doi: 10.1142/S1402925112500118. Kruglikov, Boris; Matveev, Vladimir. Nonexistence of an integral of the 6th degree in momenta for the Zipoy-Voorhees metric. Physical Review D. Particles and fields 2012; Volum 85 (12). ISSN 0556-2821.s doi: 10.1103/PhysRevD.85.124057. Kruglikov, Boris; Morozov, Oleg. SDiff(2) and uniqueness of the Plebanski equation. Journal of Mathematical Physics 2012; Volum 53 (8). ISSN 0022-2488.s doi: 10.1063/1.4739749. Kruglikov, Boris. Symmetry, Compatibility and Exact Solutions of PDEs. Acta Applicandae Mathematicae - An International Survey Journal on Applying Mathematics and Mathematical Applications 2012; Volum 120 (1). ISSN 0167-8019.s 219 - 236.s doi: 10.1007/s10440-012-9708-0. Kruglikov, Boris. The gap phenomenon in the dimension study of finite type systems. Central European Journal of Mathematics 2012; Volum 10 (5). ISSN 1895-1074.s 1605 - 1618.s doi: 10.2478/s11533-012-0070-2. Kruglikov, Boris. Finite-dimensionality in Tanaka theory. Annales de l'Institut Henri Poincare. Analyse non linéar 2011; Volum 28 (1). ISSN 0294-1449.s 75 - 90.s doi: 10.1016/j.anihpc.2010.10.001. Kruglikov, Boris. Laplace transformation of Lie class ω = 1 overdetermined systems. Journal of Nonlinear Mathematical Physics 2011; Volum 18 (4). ISSN 1402-9251.s 583 - 611.s doi: 10.1142/S1402925111001805. Anderson, Ian; Kruglikov, Boris. Rank 2 distributions of Monge equations: Symmetries, equivalences, extensions. Advances in Mathematics 2011; Volum 228 (3). ISSN 0001-8708.s 1435 - 1465.s doi: 10.1016/j.aim.2011.06.019. Kruglikov, Boris. Involutivity of field equations. Journal of Mathematical Physics 2010; Volum 51 (3). ISSN 0022-2488.s doi: 10.1063/1.3305321. Kruglikov, Boris; Lychagin, Valentin. Compatibility, Multi-brackets and Integrability of Systems of PDEs. Acta Applicandae Mathematicae - An International Survey Journal on Applying Mathematics and Mathematical Applications 2010; Volum 109 (1). ISSN 0167-8019.s 151 - 196.s doi: 10.1007/s10440-009-9446-0. Eschenburg, JH; Kruglikov, Boris; Matveev, VS; Tribuzy, R. Compatibility of Gauss maps with metrics. Differential geometry and its applications (Print) 2010; Volum 28 (2). ISSN 0926-2245.s 228 - 235.s doi: 10.1016/j.difgeo.2009.10.004. Kruglikov, Boris; Lychagin, Valentin. Differential invariants of the motion group actions. Nova Science Publishers, Inc. 2009 ISBN 978-1-60456-920-9.s 237 - 251. Kruglikov, Boris. Point Classification of Second Order ODEs:Tresse Classification Revisited and Beyond. Springer Publishing Company 2009 ISBN 978-3-642-00872-6.s 199 - 221. Kruglikov, Boris Serafimovich. Invariant characterization of Liouville metrics and polynomial integrals. Journal of Geometry and Physics 2008; Volum 58. ISSN 0393-0440.s 979 - 995.s doi: 10.1016/j.geomphys.2008.03.005. Kruglikov, Boris Serafimovich. Symmetry approaches for reductions of PDEs, differential constraints and Lagrange-Charpit method. Acta Applicandae Mathematicae - An International Survey Journal on Applying Mathematics and Mathematical Applications 2008; Volum 101. ISSN 0167-8019.s 145 - 161.s doi: 10.1007/s10440-008-9197-3. Kruglikov, Boris Serafimovich. Tangent and normal bundles in almost complex geometry. Differential geometry and its applications (Print) 2007; Volum 25. ISSN 0926-2245.s 399 - 418.s doi: 10.1016/j.difgeo.2007.02.007. Kruglikov, Boris Serafimovich; Lychagin, Valentin. Spencer delta-cohomology, restrictions, characteristics and involutive symbolic PDEs. Acta Applicandae Mathematicae - An International Survey Journal on Applying Mathematics and Mathematical Applications 2007; Volum 95. ISSN 0167-8019.s 31 - 50.s doi: 10.1007/s10440-006-9080-z. Kruglikov, Boris Serafimovich; Lychagin, Valentin. Mayer brackets and solvability of PDES - II. Transactions of the American Mathematical Society 2006; Volum 358. ISSN 0002-9947. Kruglikov, Boris Serafimovich; Lychagin, Valentin. Invariants of pseudogruop actions: Homological methods and Finiteness theorem. International Journal of Geometric Methods in Modern Physics (IJGMMP) 2006; Volum 3. ISSN 0219-8878. Kruglikov, Boris Serafimovich; Lychagin, Valentin. Multi-brackets of differential operators and compatibility of PDE systems. Comptes rendus. Mathematique 2006; Volum 342. ISSN 1631-073X. Kruglikov, Boris Serafimovich; Matveev, VS. Strictly non-proportional geodesically equivalent metrics have h(top)(g)=0. Ergodic Theory and Dynamical Systems 2006; Volum 26. ISSN 0143-3857. Kruglikov, Boris Serafimovich; Matveev, VS. Vanishing of the entropy pseudonorm for certain integrable systems. Electronic research announcements of the American Mathematical Society 2006; Volum 12. ISSN 1079-6762. Kruglikov, Boris Serafimovich. Note on two compatibility criteria: Jacobi-Mayer bracket vs. differential Gröbner basis. Lobachevskii Journal of Mathematics 2006; Volum 23. ISSN 1818-9962.s 57 - 70. Kruglikov, Boris Serafimovich; Lychagina, Olga. Finite dimensional dynamics for Kolmogorov-Petrovsky-Piskunov equation. Lobachevskii Journal of Mathematics 2005; Volum 19. ISSN 1818-9962.s 13 - 28. Kruglikov, Boris Serafimovich; Lychagin, Valentin. A compatibility criterion for systems of PDEs and generalized Lagrange-Charpit method. (prosjekt) AIP Conference Proceedings 2004; Volum 729. ISSN 0094-243X.s 39 - 53. Kruglikov, Boris Serafimovich. Characteristic distributions on 4-dimensional almost complex manifolds. Banach Center Publications 2004; Volum 62. ISSN 0137-6934.s 173 - 182. Kruglikov, Boris Serafimovich. Deformation of big pseudoholomorphic disks and application to the Hanh pseudonorm. Comptes rendus. Mathematique 2004; Volum 338 (4). ISSN 1631-073X.s 295 - 299. Kruglikov, Boris Serafimovich; Lychagin, Valentin. Transitive and transversal actions of pseudogroups on submanifolds. Russian Mathematics (Izvestiya VUZ. Matematika) 2004; Volum 10. ISSN 1066-369X. Kruglikov, Boris Serafimovich. Non-existence of higher dimensional pseudoholomorphic submanifolds. Manuscripta mathematica 2003; Volum 111. ISSN 0025-2611.s 51 - 69. Kruglikov, Boris Serafimovich; Lychagin, Valentin. Mayer brackets and solvability of PDEs. I. Differential geometry and its applications (Print) 2002; Volum 17 (2-3). ISSN 0926-2245.s 251 - 272. Kruglikov, Boris Serafimovich. Examples of integrable sub-Riemannian geodesic flows. Journal of dynamical and control systems 2002; Volum 8 (3). ISSN 1079-2724.s 323 - 340. Kruglikov, Boris Serafimovich. Examples of symplectic $Q\sp 3\times S\sp 1$. (fulltekst) Mathematical Publications 2001; Volum 3.s 93 - 103. Kruglikov, Boris Serafimovich; Overholt, Marius. Pseudo-holomorphic mappings and Kobayashi hyperbolicity. Differential geometry and its applications (Print) 1999; Volum 11 (3). ISSN 0926-2245.s 265 - 277. Kruglikov, Boris Serafimovich. Exact classification of divergence-free nondivergent vector fields on surfaces of small genus. Mathematical Notes 1999; Volum 65 (3). ISSN 0001-4346.s 280 - 294. Kruglikov, Boris Serafimovich. Existence of close pseudoholomorphic disks for almost complex manifolds and their application to the Kobayashi-Royden pseudonorm. Functional analysis and its applications 1999; Volum 33 (1). ISSN 0016-2663.s 38 - 48. Kruglikov, Boris Serafimovich; Lychagin, Valentin. On equivalence of differential equations. Acta et Commentationes Universitatis Tartuensis de Mathematica 1999; Volum 3. ISSN 1406-2283.s 7 - 29. Kruglikov, Boris Serafimovich. The image in $H\sp 2(Q\sp 3;R)$ of the set of closed 2-forms with preassigned kernel. Journal of Mathematical Sciences 1999; Volum 94 (2). ISSN 1072-3374.s 1218 - 1225. Kruglikov, Boris Serafimovich. Classification of Monge-Ampère equations with two variables. Banach Center Publications 1999; Volum 50. ISSN 0137-6934.s 179 - 194. Kruglikov, Boris Serafimovich. Symplectic and contact Lie algebras with application to the Monge-Ampère equation. Proceedings of the Steklov Institute of Mathematics 1998; Volum 221 (2). ISSN 0081-5438.s 221 - 235. Kruglikov, Boris Serafimovich. On some classification problems in four-dimensional geometry: distributions, almost complex structures, and the generalized Monge-Ampère equations. Sbornik. Mathematics 1998; Volum 189 (11). ISSN 1064-5616.s 1643 - 1656. Kruglikov, Boris Serafimovich. Nijenhuis tensors and obstructions to the construction of pseudoholomorphic mappings. Mathematical Notes 1998; Volum 63 (4). ISSN 0001-4346.s 476 - 493. Kruglikov, Boris Serafimovich. Exact smooth classification of Hamiltonian vector fields on two-dimensional manifolds. Mathematical Notes 1997; Volum 61 (2). ISSN 0001-4346.s 146 - 163. Kruglikov, Boris Serafimovich. Obstacles to the construction of pseudoholomorphic mappings. Russian Mathematical Surveys 1997; Volum 52 (3). ISSN 0036-0279.s 611 - 612. Kruglikov, Boris Serafimovich. On the image in $H\sp 2(Q\sp 3;\bold R)$ of the set of presymplectic forms with a given kernel. Sbornik. Mathematics 1997; Volum 188 (1). ISSN 1064-5616.s 75 - 85. Kruglikov, Boris Serafimovich. A remark on symplectic packings. Doklady Akademii Nauk 1996; Volum 350 (6). ISSN 0869-5652.s 730 - 734. Kruglikov, Boris Serafimovich. Monotonicity of a rotation function, and anticonsistent contact structures. Russian Mathematical Surveys 1996; Volum 51 (1). ISSN 0036-0279.s 148 - 149. Kruglikov, Boris Serafimovich. On an invariant of a characteristic distribution. Russian Mathematical Surveys 1995; Volum 50 (4). ISSN 0036-0279.s 816 - 817. Kruglikov, Boris Serafimovich. Existence of a pair of complementary Bott integrals for a resonance Hamiltonian system with two degrees of freedom. Proceedings of the Steklov Institute of Mathematics 1995; Volum 205 (4). ISSN 0081-5438.s 99 - 102. Kruglikov, Boris Serafimovich. On the continuation of a symplectic form and a pair of functions in involution to $S\sp 1\times I\times T\sp 2$. Proceedings of the Steklov Institute of Mathematics 1995; Volum 205 (4). ISSN 0081-5438.s 87 - 97. Kruglikov, Boris; Lychagin, Valentin; Straume, Eldar. Differential Equations: Geometry, Symmetries and Integrability. Springer Publishing Company 2009 ISBN 978-3-642-00872-6.s 75 - 106. Kowalski, Oldřich; Krupka, Demeter; Krupkova, Olga; Kruglikov, Boris; et al, .... Differential geometry and its applications: proceedings of the 10th International Conference, DGA 2007, Olomouc, Czech Republic, 27-31 August 2007. World Scientific 2008 ISBN 9812790608. Gaeta, Giuseppe; Vitolo, Raffaele; Walcher, Sebastian; Kruglikov, Boris; et al, .... SYMMETRY AND PERTURBATION THEORY Proceedings of the International Conference on SPT 2007. World Scientific 2008 ISBN 978-981-277-616-7. Krupka, Demeter; Saunders, David; Kruglikov, Boris; Lychagin, Valentin; et al, .... Handbook of global analysis. Elsevier 2008 ISBN 978-0-444-52833-9. Kruglikov, Boris. The dimension problem in CR-geometry. Northern California Symplectic Geometry Seminar 2017-03-13 - 2017-03-13 2017. Kruglikov, Boris. Integrable dispersionless systems via the geometry of solutions and the solutions spaces. RTGC Seminar 2017-03-10 - 2017-03-10 2017. Kruglikov, Boris. Integrable systems associated to submanifolds in Grassmanians. Mathematical Physics Seminar 2017-05-23 - 2017-05-23 2017. Kruglikov, Boris. Local non-existence of polynomial integrals for geodesic flows. The 4th international conference on Finite-Dimensional Integrable Systems 2017-07-03 - 2017-07-07 2017. Kruglikov, Boris. Rigidity of 2-step Carnot algebras. Geometry, Gravity and Supersymmetry 2017-04-24 - 2017-04-27 2017. Kruglikov, Boris. Orthogonal complex structures near the round S^6. (Non)-existence of complex structures on S^6 2017-03-27 - 2017-03-30 2017. Kruglikov, Boris. Differential Invariants: Calculus and Count. The 37th winther school on geometry and Physics 2017-01-14 - 2017-01-21 2017. Kruglikov, Boris. Symmetry breaking in parabolic geometries. Algebraic Geometry and Mathematical Physics 2016-06-30 - 2016-07-01 2016. Kruglikov, Boris. The gap phenomenon in parabolic geometry. Modern Advances in Geometry and Topology 2016-09-12 - 2016-09-14 2016. Kruglikov, Boris. Sub-maximally symmetric quaternionic spaces. Seminar of Laboratory of algebraic geometry, HSE 2016-09-09 - 2016-09-09 2016. Kruglikov, Boris. Integrability in Grassmann and other Geometries. LMS-EPSRC Symposium on Integrable Systems 2016-07-25 - 2016-08-04 2016. Kruglikov, Boris. Jet-determination in parabolic geometries. Differential Geometry an its Applications 2016-07-11 - 2016-07-15 2016. Kruglikov, Boris. Integrability in Grassmann geometries. Geomertric Analysis and Vision Theory 2016-05-09 - 2016-05-14 2016. Kruglikov, Boris. C-projective structures with large symmetry. Almost Hermitian and contact geometry 2015-10-18 - 2015-10-24 2015. Kruglikov, Boris. Sub-maximal symmetry and integrability. Workshop on Integrable Nonlinear Equations 2015-10-18 - 2015-10-24 2015. Kruglikov, Boris. On the integrability of some rank 2 sub-Riemannian structures. FDIS2015 - Third conference on finite-dimensional integrable systems 2015-07-12 - 2015-07-17 2015. Kruglikov, Boris. Self-Duality and Symmetric Deformations of Integrable PDE. Physics and Mathematics of Nonlinear Phenomena 2015-06-20 - 2015-06-27 2015. Kruglikov, Boris. Differential Invariants and Symmetry. Differential Geometry, Geometric Invariants and Vision Theory 2015-04-23 - 2015-04-25 2015. Kruglikov, Boris. Tanaka theory and dimensional bounds for the symmetry algebras. Equivalence, invariants, and symmetries of vector distributions and related structures : from Cartan to Tanaka and beyond 2014-12-10 - 2014-12-12 2014. Kruglikov, Boris. Integrable symmetric deformations of dispersionless PDEs. Integrable Day 2014-11-28 - 2014-11-28 2014. Kruglikov, Boris. Symmetry bounds for filtered geometric structures. Vector Distributions and Related Geometries 2014-06-02 - 2014-06-07 2014. Kruglikov, Boris. Homogeneous almost complex and related structures in dimension 6. 47th Seminar Sophus Lie 2014-05-29 - 2014-05-31 2014. Kruglikov, Boris. Integrability of dispersionless PDE in 3D and Einstein-Weyl geometry. Workshop on Geometry of PDEs and Integrability 2013-10-14 - 2013-10-18 2013. Kruglikov, Boris. Einstein-Weyl geometry and Integrability of dispersionless PDEs. Conference on Integrability, Topological Obstructions to Integrability and Interplay with Geometry 2013-09-16 - 2013-09-20 2013. Kruglikov, Boris. The gaps phenomenon for symmetry pseudogroups. Workshop on Exterior Differential Systems and Lie theory 2013-12-09 - 2013-12-13 2013. Kruglikov, Boris. Integrability of Dispersionless PDEs in 3D and Einstein-Weyl geometry. Differential Geometry and its Applications 2013-08-19 - 2013-08-23 2013. Kruglikov, Boris. Dispersionless integrable PDEs and Einstein-Weyl geometry. Physics and Mathematics of Nonlinear Phenomena 2013 2013-06-22 - 2013-06-29 2013. Kruglikov, Boris. Gaps, Symmetry, Integrability. Nonlinear Mathematical Physics: 20 years of JNMP 2013-06-04 - 2013-06-14 2013. Kruglikov, Boris. Global Lie-Tresse theorem. The Interaction of Geometry and Representation Theory. Exploring new frontiers 2012-09-10 - 2012-09-14 2012. Kruglikov, Boris. Global Lie-Tresse theorem. Symmetries of Differential Equations: Frames, Invariants and Applications 2012-05-17 - 2012-05-20 2012. Kruglikov, Boris. A tale of two G2. Colloquium of the La Trobe University 2012-04-22 - 2012-04-22 2012. Kruglikov, Boris. Global Lie-Tresse theorem. Sydney Algebra group 2012-03-16 - 2012-03-16 2012. Kruglikov, Boris. Hamiltonian integrability in geometry and relativity. Sydney Dynamics group 2012-03-16 - 2012-03-16 2012. Kruglikov, Boris. Sub-maximal symmetric models for geometric structures. ANU DG seminar 2012-02-29 - 2012-02-29 2012. Kruglikov, Boris. Symmetry analysis of non-integrable almost complex structures. ANU DG seminar 2012-02-07 - 2012-02-07 2012. Kruglikov, Boris. Symmetries of ODEs, PDEs, geometric structures and rank 2 distributions. 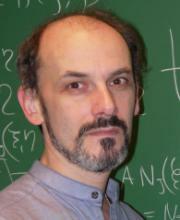 Geometry - Mathematical Physics meeting in Telc 2011-10-21 - 2011-10-23 2011. Kruglikov, Boris. Symmetries of rank 2 distributions: 100 years since Cartan. Workshop on dynamical systems 2011-05-17 - 2011-05-19 2011. Kruglikov, Boris. Cartan’s 5 variables centennial: Monge equations and rank 2 distributions. Tanaka theory and hypersurfaces theory 2011-01-23 - 2011-01-30 2011. Kruglikov, Boris. Cartan’s 5 variables centennial: Monge equations, rank 2 distributions and symmetries of ODEs and PDEs. Symmetry and Perturbation Theory 2011-06-05 - 2011-06-12 2011. Kruglikov, Boris. The gap phenomenon in finite type systems. Finite dimensional type Systems in Differential Geometry and Mathematical Physics 2011-07-26 - 2011-07-29 2011. Kruglikov, Boris. Cartan's 5 variables centennial. Invited lecture at Math.Physics seminar at Imperial College 2010-05-10 - 2010-05-10 2010. Kruglikov, Boris; Lychagin, Valentin; Alexander, Verbovetsky. Joseph Krasil'shchik-Dedication. Acta Applicandae Mathematicae - An International Survey Journal on Applying Mathematics and Mathematical Applications 2010; Volum 109 (1). ISSN 0167-8019.s 1 - 3.s doi: 10.1007/s10440-009-9453-1. Kruglikov, Boris. Entropy via Multiplicity re-visited. Dynamics and PDEs 2010-02-15 - 2010-03-12 2010. Kruglikov, Boris. Topology of attractors of dynamical systems. Topology and its Applications 2010-06-26 - 2010-06-30 2010. Kruglikov, Boris. Laplace transformations of symmetric Monge equations and PDEs. MOGRAN-14 2010-05-29 - 2010-06-02 2010. Kruglikov, Boris. Symmetric almost complex structures in low dimensions and pseudoholomorphic foliations. Almost Complex Geometry and Foliations 2010-05-23 - 2010-05-29 2010. Kruglikov, Boris. From Cartan's 5 variables to overdetermined PDEs and Monge equations. Mini-workshop on Differential Systems 2009-10-31 - 2009-11-03 2009. Kruglikov, Boris. Lie N=1 theorem and Laplace transformations. 25th Nordic and 1st British-Nordic congress of Mathematicians 2009-06-08 - 2009-06-11 2009. Kruglikov, Boris. Point classification of 2nd order ODEs and Lie-Tresse theorem. Workshop: Geometry of ODE's and Vector Distributions 2009-01-05 - 2009-01-16 2009. Krasil'shchik, Iosif; Kruglikov, Boris Serafimovich. Valentin Lychagin - A dedication. Acta Applicandae Mathematicae - An International Survey Journal on Applying Mathematics and Mathematical Applications 2008; Volum 101. ISSN 0167-8019.s 1 - 3.s doi: 10.1007/s10440-008-9206-6. Lychagin, Valentin; Kruglikov, Boris Serafimovich. Multi-brackets of differential operators and compatibility. University of Joensuu 2006-04-02 - 2006-04-09 2006. Lychagin, Valentin; Kruglikov, Boris Serafimovich. Compatibility, multi-brackets and integrability of systems of PDEs. 2006. Lychagin, Valentin; Kruglikov, Boris Serafimovich. Dimension of the solutions space of PDEs. 2006. Kruglikov, Boris Serafimovich. Spencer cohomology, Cohen-Macaulay and involutive systems. Global integrability and field theories 2006-11-01 - 2006-11-04 2006. Kruglikov, Boris Serafimovich. Spencer cohomology: from Cohen-Macaulay to involutive systems. ICM-2006 Satellite: Advances In Partial Differential Equations Geometry 2006-08-30 - 2006-09-02 2006. Kruglikov, Boris Serafimovich. Entropy of piece-wise affine maps. International Congress of Mathematicians 2006-08-22 - 2006-08-30 2006. Kruglikov, Boris Serafimovich. Multi-brackets of differential operators and integrability of PDEs. Formal theory of partial differential equations and their applications 2006-04-02 - 2006-04-09 2006. Kruglikov, Boris Serafimovich. Entropy via Buzzi multiplicity. Colloquium in Dynamical Systems and Smooth Ergodic Theory (data) 2005-06-20 - 2005-06-25 2005. Lychagin, Valentin; Kruglikov, Boris Serafimovich. Spencer delta-cohomology, restrictions, characteristics and involutive symbolic PDEs. 2005. Lychagin, Valentin; Kruglikov, Boris Serafimovich. Mayer brackets and PDEs solvability. 2001. Kruglikov, Boris Serafimovich. Almost complex geometry. Mini-course 2000-12-04 - 2000-12-07 2000. Kruglikov, Boris Serafimovich. Nijenhuis tensors in pseudoholomorphic curves neighborhoods. (fulltekst) 2000 (40). Kruglikov, Boris Serafimovich. Equivalence problem in non-holonomic Riemannian geometry. Workshop on APPLICATIONS OF SINGULARITY THEORY TO WAVE PROPAGATION THEORY AND DYNAMICAL SYSTEMS 2000-09-25 - 2000-09-29 2000. Lychagin, Valentin; Kruglikov, Boris Serafimovich. On equivalence of differential equations. 1999.